Tom Wolfe, who died this week, was not exactly a favorite person in the art world (or the literary world, for that matter). In a modern era, he was a throwback, a man who preferred realism of a particular kind. The first curator, a Matisse expert in France, roared with laughter, Ms. Spurling said, and dismissed the idea out of hand. The second, in Russia, grew angry, telling her the show would debase and vulgarize the works. “You might as well have a show on Matisse and goldfish, Matisse and oranges or vases,” Ms. Spurling recalls the curator saying. You may recall the end of that story: Just such an exhibition organized many years later by the Royal Academy was shown to great acclaim there in London, at the Met and at a museum in Lille, France. And I, too–though hardly of such knowledge–had once merely suggested a show to a curator, who also grew angry. So I put it in writing, the ideas of these writers. Spurling, Francine Prose, Tracy Chevalier and Calvin Thomkins all obliged me. 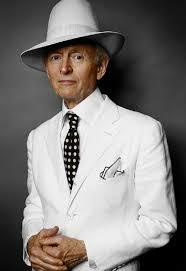 But Tom Wolfe responded to my email saying (in part–elises mine): “Nice idea. Me, I’d like to see a show of the REAL art of the 20th century….first I should figure out what REAL pieces should be in the REAL show.” By deadline, he’d not come up with anything. Got a kick out of your piece! I only wished I HAD sent you a catalogue. Bruno Paul, Rudolf Wilke, Olaf Gulbrannsen, Karl Arnold, A. M. Cassandre, Alan Crossland, Egon Tschich, Caran D’Ache, George Bellow, Reginald Marsh, Toulouse-Lautrec—and others whose work was actually tied to the world around them . . . as the work of fashionable art world favorites from Picasso on never was. Picasso with his minotaurs and badly drawn girls with two eyes on the same side of the nose . . . Give—me—a—break . . .
No wonder the art world disliked him. My article, headlined Curators Can Curate, But Writers Can Try, Too, was published in the NYT on Mar. 29, 2006.